A few weeks ago our customer for the London tunnel project approached me and asked me to prepare a presentation about some of the quality topics in reference to our works package – GFRC panels. I decided to give a short speech about the quality processes that we used in manufacturing of GFRC concrete panels. I developed the present post based on that presentation. This article is the first one in a series about our experiences with designing, manufacturing and installing GRC cladding. Manufacturing of glass fibre reinforced concrete panels or other GRC elements involves large amount of quality checks at every step of production. Before we started with production of GFRC panels for our construction project in London we had to analyse the needs based on our design and of course based on the client’s demanding architectural specification. Designers, engineers, quality managers, specialist consultants, site managers and project managers were all involved together to make sure we can achieve the high standard of our GFRC cladding. Even though we had extensive quality procedures for manufacturing of various types of cladding we had to start from scratch with quality checks for GFRC. We started from checking all the available standards and specification which were required under the contract. We listed main testing requirements for GFRC as well as material checks. However, we decided to carry out a few more extra checks on GRC. When materials arrived into the factory first step was to check if the supplier provided correct information about material origin and its specification. For cement we checked the right type of Portland cement was used. In this case our mix included both white and grey cement of specific type and ratio. Next we also carried out the check on silica sand and other aggregates. Not only we checked the incoming materials in terms of documents, but also did the sieve tests to check if the sand was the correct size. For this purpose we used specialist sieves with various mesh sizes on them. We used clean and empty sieves that we weighted on scale and we recorded their weight in notes. Quality personnel took sand sample randomly from the delivered quantity. They did it directly from the delivery trailer or from the material storage area in the factory. Minimum three 300g samples were taken at random from the sand stack, trailer, batching plant or bag. Next, we poured the sand sample into the top sieve with the largest mesh size. Each sieve beneath the top one in the column had smaller mesh than the one above. The column was shaken for approximately 1 minute. After the shaking was completed the material on each sieve was weighed. The weight of the sample of each sieve was then divided by the total weight of sieve and sample together to calculate a percentage retained on each sieve. 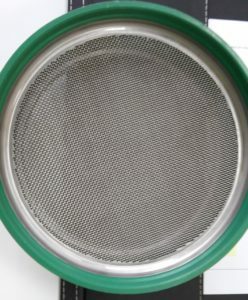 It is recommended that for GRC a fine grain silica sand is used, therefore, for the sieve test we used small size mesh. We analysed the size of the average particle on each sieve to get a cut-off point or specific size range, which we then captured on the mesh. Our team recorded the results and presented them in a table. Its rows showed different sieve sizes and columns displayed weight and percentage of grain of that particular size. How often should you do the sieve test? Definitely at least with every new delivery of aggregates. What about if you already have a pile of sand or full silo of it? It depends on a few factors. Mostly it’s about your own quality procedures and assurance that the GFRC materials you are going to produce will be consistent. If you store bulk quantity of different sands for different types of GFRC mix than it’s best to test more frequently. Is this test suitable only for silica sand? No, you can test other aggregates in the same manner. GRC panels can vary in their face coat finish depending on the architectural requirements. If your GRC mix includes shiny and darker aggregates you should sieve test these materials as well. We not only checked silica sand or other aggregates during the manufacturing of GFRC cladding. Among other materials we inspected were chemical additives, cast-in brackets, glass fibre roving and moulds for glass fibre reinforced concrete panels. We checked all data sheets and delivery notes for chemical additives against compliance with GRC mix and specification requirements. Our design included stainless steel plates that we casted in GRC cladding during spraying. We checked brackets’ dimensions against the manufacturing drawings. Dimensions of these brackets and more importantly casting process were crucial for the team that installed GRC cladding on site. With incorrect type of plates or wrong casting these GFRC panels would not fit into the substructure. Another items that required meticulous inspections during the production of GFRC panels were moulds. Damaged mould, incorrect type or size out of tolerance would cause a lot of troubles. If we produced GFRC panels from the damaged mould these panels would be defected as well. We had to check each mould before its use. Dedicated person reviewed the dimensions of mould to make sure these didn’t stretch out of tolerance. Additionally, we inspected mould surface for any even tiny flaws like cracks, dents, blowholes, etc. Some flaws we repaired with our own operatives. However, the mould manufacturer fixed surface inconsistencies or larger damage. Glass fibre is essential part of the GRC mix, therefore, its quality is also of great importance. Only a few worldwide renowned manufactures supply glass fibre in roving or chopped strands to GRC concrete producers. What is the difference between the two? GFRC suppliers use roving glass fibres usually for the sprayed technique. Its a long fibre in a roving form which you can fit into the GRC spraying equipment. Its filament diameter is often smaller than those fibres for poured method. This specialist machine is able to supply roving fibres and pump the concrete at the same time. Therefore, there is another term for the sprayed GRC method – simultaneous projection. It allows for projecting fibres and concrete at the same time with one machine. When you project glass fibre it runs through a specialist dispenser/gun. It contains a rotating blade which cuts the continuous roving into the shorter glass fibre elements. Chopped strands is the glass fibre which was already cut to the specific length. You can use it for sprayed and poured method of GFRC panels production. When you use it for sprayed technique you need slightly different spraying equipment. You need to have a small hopper at the end of the gun which will feed the fibres into the spraying machine. 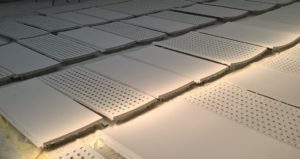 How is glass fibre important to the quality process and manufacturing of GFRC panels? For high quality GRC concrete you need to make sure your glass fibre is also of great standard. We used glass fibres with high zirconia content. This amount ranged between 16-19%. Zirconia helps glass fibres to be alkali and acid resistant. Usually this type of glass fibre includes marking ARG – alkali resistant glass fibre. Part of quality process was to source the suppliers and dealers who certified zirconia content in their glass fibre.